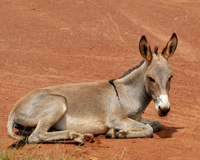 Donkeys and mules are suffering and dying at brick factories in Nepal. It's time for government officials to step in and stop the cruelty. The lives of mules and donkeys in Nepalese brick factories are brutal and short. These poor creatures are literally worked to death; some have simply dropped dead in the middle of the work day. A local animal welfare group is working to raise awareness and stop the cruelty. Sign their petition demanding the Nepalese government act to stop abuse at brick factories. The wounds these animal endure while carrying bricks to and from kilns are horrible and graphic. At least one has been worked to the bone: photos show trauma injuries that left its spine exposed. According the group on the ground, 15 equines have died just since December. We can't stand by while mules and donkeys continue to be overworked, overloaded and beaten until they expire. Demand Nepalese ministers of finance, agriculture and industries act now to stop abuse at these bloody brick factories.